So since it's December and I've been making a list of ideas for ages anyway, I thought I'd put together a little gift guide. These ideas are all under £15 so would be perfect for a small gift to a friend, secret santa or even a stocking filler for your lovely girlfriend. Andy, I hope you're reading this and picking up on the not-so-subtle hints. I'm a total sucker for a novelty gift and I love the cake mix in a jar - it's presented so well and who doesn't want a quick step to freshly made brownies straight out the oven? Or, for an even more impatient friend, you could get 'Mug Cakes' - a full recipe book on cakes that can be made in a mug, in the microwave, in under five minutes. Some beauty favourites are the Caudalie Mini Beauty Elixir spray - this is an amazing product and you get a lot for your money with this gift too. Another good mini is This Works Dream Team which includes the famous pillow spray and stress less roller - these are usually quite expensive, but you can get both miniatures for £10 in this set. This Body Shop set is another good bargain and pretty fool-proof in terms of gifts, since it's almost impossible not to love it. For someone that's not into beauty, a diary planner is always a good idea - I love this one from Paper Chase. They have a massive selection of designs too! And of course, a stocking filler guide isn't complete without a pair of socks. A kitten in a hat and scarf, could that be any cuter. Hope you like this gift guide ... do you have any good ideas for stocking fillers? 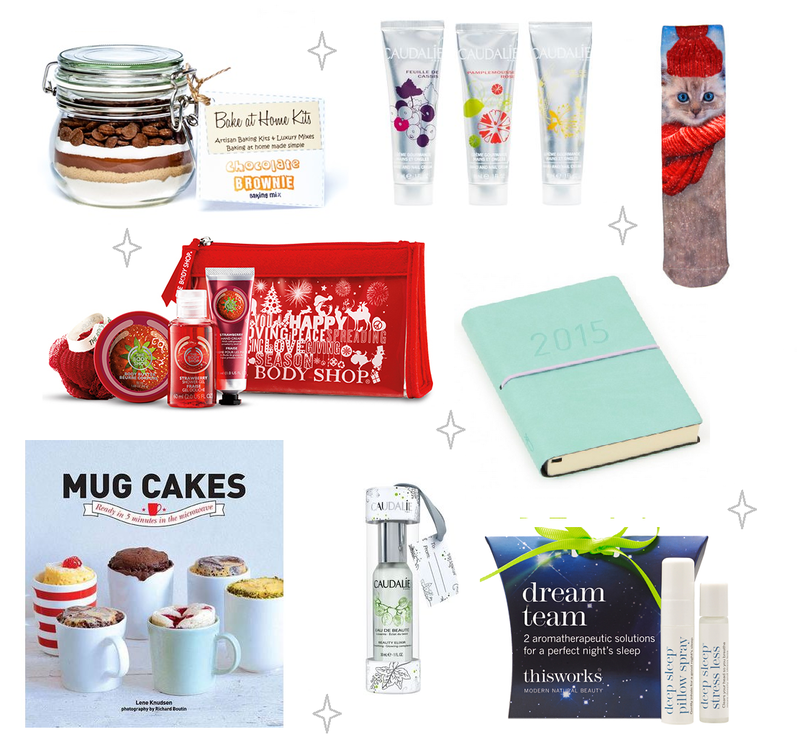 26 comments on "Gift Guide: Stocking Fillers Under £15 (for her)"
Very cute gift ideas! Especially love the diary it is so lovely! Really love these idea's! Mega cute and all a really reasonable price! I love The Body Shop's giftsets, if someone bought me a coconut one I'd be so happy! The cake mix in a jar is the cutest gift idea! I saw those cat socks in Topshop the other day - had to resist buying them for myself! I saw those "cake in jar" things at Christmas fair I went to, and I went back for this chocolate brownie one which I'd had my heart set on all the way round, only for it to be sold out! I was gutted! Would love one of those as a present, I thought they were so cute and really handy to have it all measure out for you, can just mix it all together. Love this post and the ideas :) all so thoughtful! Love the look of those kitty socks & the mug cake recipes sound fab! These are great...although you had me at the brownie mix in a jar! Awww the cake mix in a jar idea is so cute! I haven't actually tried making cake in a mug before - not quite sure why but it's an excellent idea! And I think diary planners and notebooks are great for those who love stationery. Paperchase's designs are beautiful but I also like some indie stationery shops on Etsy for something more unique.